Plastic pallets can represent a substantial fire hazard in warehouses, shipping centers and long-term storage facilities. Compared to wood, conventional plastic pallets require higher sprinkler water discharge rates to deliver sufficient protection in an emergency. FM 4996 approval provides a measure of confidence that a plastic pallet will deliver fire protection as good as or better than its wooden counterpart. Suitable for use in any facility where fire safety is a priority, Polymer Solutions International manufactures a wide selection of FM-approved, non-halogen plastic pallets. Get the safety and peace of mind you need while still enjoying all the benefits of our lightweight, durable plastic product. Contact our office directly and request a quote today. FM Approvals is an internationally recognized, independent testing and certification agency. The organization employs evidence-based research and testing to determine whether or not a given product can meet its high standards for commercial and industrial loss prevention. FM approval is only extended to fire-retardant plastic pallets that perform equal to or better than conventional wood pallets when it comes to heat release. In order to become FM-approved, a plastic pallet must undergo comprehensive review and testing at a third-party lab. Regular follow-up audits ensure that integrity is maintained and standards upheld at all times. Older flame-retardant plastic pallets used halogen-based chemicals, such as decabromodiphenyl ether (deca-BDE), to coat their products. Over the past decade, a mounting body of scientific evidence has pointed to significant health problems associated with long-term exposure to deca-BDE, such as liver and thyroid damage, as well as reproductive, development and neurological impairment. For this reason, many states and industries have begun to phase out the use of deca-BDE in certain products. Even if you’re not legally required to, choosing to use non-deca-BDE plastic pallets keeps your workers safe and positions you for future regulatory compliance, should anything change in the future. 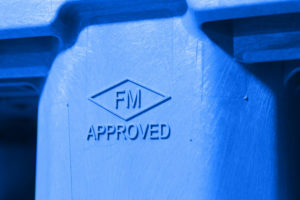 Polymer Solutions International, Inc. is the only plastic pallet provider in the United States with Non-Toxic FM Approval. PSI plastic pallets are fully halogen-free while still meeting FM standards for flame resistance. Lightweight, affordable and built to last for the long haul, our products deliver peace of mind and unrivaled performance in a number of different industries and applications. Our non-halogen plastic pallets received FM approval in May 2015, meeting the demand of our global customer base for products that are safer and better for the environment. In addition to meeting international standards for flame protection, our pallets are fully recyclable and available with FDA-approved hygienic coatings for use in food, pharmaceutical and other applications. Want to learn more about our current lineup of FM-approved products? Contact our office by phone or email to speak with a sales representative and discover some of the many benefits of making PSI your exclusive provider of halogen-free plastic pallets.